Winter is not my favorite season when it comes to riding my horse. If you’re like me, you get easily bored in your indoor arena. When asking an equestrian what their favorite season is, you’ll most likely hear Summer, or Spring, or Fall. I don’t think I’ve ever heard an equestrian say “I just love riding in the winter!” Shows and races start back up in the spring and continue into summer and fall. Sure the winter is beautiful to trail ride through woods that have a light snowfall, but once the snow hits a certain depth, we all are pushed into indoor arenas to ride. Indoor arenas can make both you and your horse feel confined. Riding a few times clockwise around the arena at a walk, trot, canter; then a few laps counterclockwise with the same routine. Not only are you bored at this point, but so is your horse. I pulled together a few different options for keeping both you and your horse from becoming bored in your indoor arena. feet off of the rail towards the center of your indoor and ride in the same motion as you would if you were on the rail, a rounded rectangle. At the long sides, allow your horse to extend, but then collect him as you come into the corners and keep him collected or slower on the shorter ends of the rectangle. This will help you increase and decrease speed smoothly. If you feel very motivated you can use various obstacles in your arena. Some obvious examples are setting up smaller jumps, or poles on the ground for you to work your horse over. But if you have long winters like we do in upstate NY, you have time to get creative. One example I read about is to set up various barrels around your arena and place a cone on a few of them. Work on walking to the barrel, stopping, picking up the cone and then walk to a second barrel and place the cone down. As you progress in this challenge, don’t stop at the barrel to grab the cone, make your horse move right past it while you grab the cone. A few other options are placing tarps on the ground and working with your horse to calmly walk over the tarp, even though it may make scary crinkling noises. I have also seen others use hanging noodles that you walk your horse through through. Walking through these various obstacles will build your horse’s confidence and trust in their riders. It is hoped that the horse will react calmly if they were to encounter something like these obstacles in real life situations. Riding in an indoor arena can also be a hassle because of trying to deal with dust. Focus more on training your horse through various obstacles or different patterns than worrying about dust by switching to one of our dust-free footings. You will never have to water your arena again! How do you stop from getting bored in the winter? We all have big pet peeves. And when it comes to horses, we are no different. I’m sure everyone has at least one thing at your horse barn that either a horse, or another person does that can just drive you insane. We all have at least one horse barn pet peeve! Other boarders “borrowing” supplies from people, and then those supplies not getting put back where they were to begin with. Halters getting left on one crosstie, and then dropped to the floor. Leaving manure in wash stalls. A boarder feeding treats to other boarder’s horses without permission. Pooping as soon as you finish mucking and bedding the stall. The worst! Pawing when they want to be fed or for attention. Rubbing their teeth together for attention, or towards another horse. Urinating when on cross ties. Pooping in their water bucket. Some of these things can make me grit my teeth and get my blood boiling. I think my biggest pet peeve of all time is when a horse poops while someone is riding in the indoor, and instead of picking up the manure after they are done riding, they leave it there. When you leave manure in your arena, you’re adding organic compounds to your footing. Dust is created from your sand particles breaking down, and the different organic matter in your footing also breaking down. Leaving manure, or hay, or bedding in your arena will make your battle with dust, that much harder. 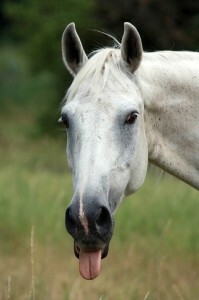 No matter what footing you have in your arena, you should always pick up your manure! Do you have any horse barn pet peeves?